Obsolete - Click here to view replacement or scroll down for related products. 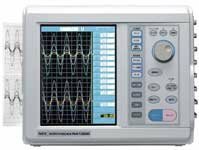 The RA1000 series (RA1100 / RA1200 / RA1300) is data acquisition equipment consisting of a recorder with enhanced functions in data display, acquisition and analysis. The RA1000's features, include easy operation and a 10" colour LCD, enable users to record data with high reliability. Moreover, the RA1000 series features an all-in-one function that can perform data acquisition to analysis via optional FFT analysis, arithmetic operation and waveform judgement functions. To increase the channel number, we have developed a dual amp (two channels per unit), which enables the realization of a multi-channel recorder with high portability. This feature provides space saving advantages such as when installing in confined spaces or in vehicles.